You know Dwight Sills. The name may not have hit you between the eyes the first time you saw it on our home page but when you think a lil’ bit you’ll remember some of your favorite musicians shouting it out after he delivered a solo that brought down the house. Check your liner notes, he’s played on quite a few of your favorite albums and if you have seen Richard Elliot, Kirk Whalum, Rick Braun, David Benoit, Gerald Albright, Everette Harp, ..you know, those and more chart topping musicians,or been on a Smooth Jazz Cruise you’ve seen him. Now you get to hear him, and you get to hear him keepin’ it totally real and every moment of this trip is innovative and captivating. 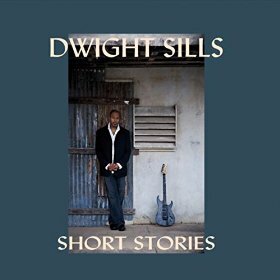 Short Stories is actually not his debut album although it could be considered his re-debut. He released three albums in the 90’s, two early in the decade and one in 1999, that fit very nicely into the mold the smooth jazz radio format was creating and demanding. Nice listening all around and even within those boundaries his musicianship and melodic sense set them apart from most. But this is a musician who plays jazz, rock, acoustic, funk, smooth, pop, R&B, everything so they only showed a facet of what he can create. This one, on the other hand, breaks through all that and delivers eight unbridled genre mashing gems. Want meditative and acoustic? Immerse yourself in “Opening” or “Closing – When All Is Said And Done,” or the lyrically shape-shifting “End of The Serpent,” as Sills works his magic around a background that melds jazzy rhythms and some tasty acoustic and fusion flavored soloing and a gorgeous melody. Listening to it lifts your spirit, which is also how you’ll feel when you hear “Homecoming,” a soaring and almost indescribable song that heads into places that mash up every influence from jam band to instrumental rock and can best be described progressive instrumental music circa 2016. Don’t wanna pin any of these songs to the past because they aren’t derivative or copycat but any musician or music fan who has been listening for years has a lot of music in their head. “Two Kids” pulls a thread from Jeff Beck’s epic Wired with some retro keyboard from Ron Reinhardt, another brilliant musician you’ve seen on stage backing everyone you love, and the dual guitar work in “Will D” reminds me of Brothers and Sisters era Allman Bros filtered through Return To Forever. Then there’s “In With The Out Crowd” which is jazz rock at it’s best with chord changes that come straight from a playbook somewhere between Mahavishnu and Satriani over driving percussion and Ingrid Jensen’s fierce trumpet work. If you came into instrumental music through rock and fusion this album is going to light you up. It’s a mandatory add to your collection. If you were later to the party and came in on the smoother side the spirit and the melodies here are going to transport you and the dynamic boundary breaking solos and shifts are exactly what you put your hands in the air for when you hear the music live. It’s rarely experienced on studio albums but Sills has managed to capture that here. This set is fired up, stretched out, melodic and adventurous. Dive in, you’ll love it and it’s going to leave you hitting that repeat button and wanting more.